In late November of 1812, after a private dinner with the American ambassaor, the Prime Minister remarked on the events of August, September, and October, "From Lubeck in the Baltic, to Naples in the Tyrrhenian Sea, an Iron Curtin has descended across the continent." Indeed, tragic news had arrived from Naples of a great and terrible disaster to coalition forces in Italy. By the end of October, 1812, Napoleon controlled the capitals of every minor European state that he could reach from France without crossing seas or crossing the territory of major European states. Although Naples had not yet been fully conquered, and although Napoleon's Bavarian allies were barely hanging on in the face of a mighty siege assault by the army of Archduke Charles, this was still an impressive feat. What the Prime Minister didn't know, due to the slow speed of getting any news out of the depths of Russia during the fall rains, was the extent of the disaster to the Tsar's forces. But he would know soon enough. The Tsar's plan for the late summer and fall was to send four corps to the area of Kiev in order to take back control of the Ukraine for the Tsar, while the main Turkish armies were in front of the main Russian army to the east. One corps of 3 militia moved to just east of Kiev. This corps was later gobbled up by a great swarm of Turks. Another of 10 infantry took Kiev, and was then in turn besieged there by a mighty army of mostly Turks. Although the Tsar collected income and manpower from the Ukraine in the September economic phase, Kiev was back in Turkish hands by the end of October. There were two other corps under Barclay that moved to the west of Kiev. When the vast swarm of Turks surged westwards in reaction to the Tsar's move to retake Kiev, this little force under Barclay had to cut and run west to the southern tip of Lithuania and of the south of the Pripet Marshes. There Barclay was caught. The Turkish commander picked Eschelon, while Barclay picked Defend. It was one of the last decisions that Barclay would get to make for a while, as his force of 14 infantry, 1 cavalry, and 10 artillery was broken in two rounds, and the thundrous pursuit by massed Turkish cavalry captured Barclay and every gun in the Tsar's artillery corps. Only about 6 or 7 of the Turkish army were killed in this battle, a poor exchange rate for the sacrifice of the Tsar's men. At the close of October, only 11 corps remained of the Tsar's once mighty host. 8 of these were concentrated under Kutusov & Bagration (somewhere around Voronezh I believe), two others were in an area just west of Turkish held Tsaritzn, perhaps heading toward Astrakhan, and one other corps was in between these groups. Facing the Tsar's forces at the end of October were 18 corps spread out from two in Astrakhan to a stack at the SE tip of Lithuanian, just south of the Pripet Marshes. These include a small French corps of 1 infantry, a small French cavalry corps of 3 cavalry, a less than full strength Piedmont corps, a Syrian corps, and two Egyptian corps. Some of the feudal corps have suffered losses to battle and foraging and may need to be stood down in order to engage in the annual levy in December. But the Sultan clearly seems to have the upper hand. At the beginning of August there was a Swedish corps at Hamburg, and next door at Lubeck two British corps under Moore were besieging the Hessians inside. Moore was replaced by Wellington during the reinforcement phase. Massena attacked at Lubeck with a mixed force of militia and infantry in two corps to relieve the besieged Hessians, choosing escalated assault. Massena was surprised when Wellington gave him the slip and withdrew to Hamburg. He had expected the British to use their superior morale and leadership to win a battle there. The following month the French were moving after the coalition, so there was time to allow another British corps and another Swedish corps to arrive at Hamburg on fleets from St. Petersburg before Massena tried anther attack. He launched the attack with two Frech corps and the Hessians. There were British troops on a depot in the area. 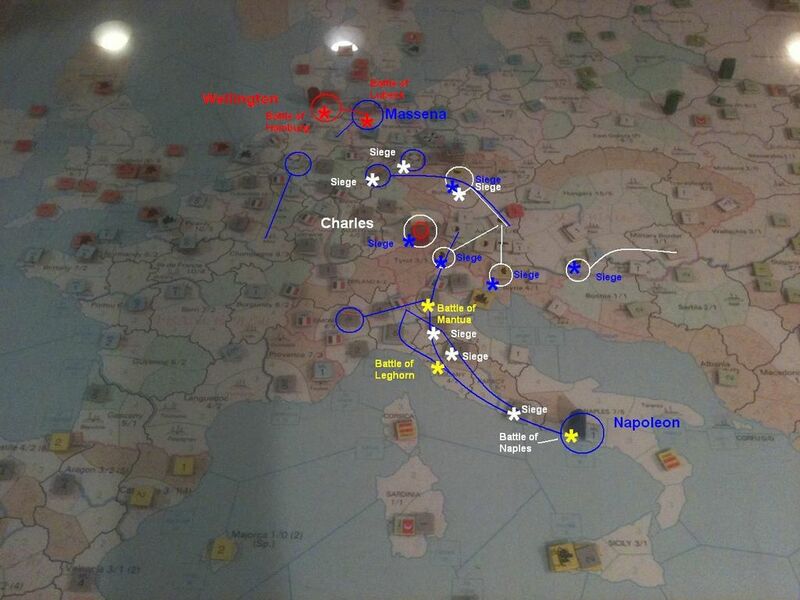 Massena again chose escalated assault, while Wellington chose outflank. The outflanking force arrived before the 2nd round, and Massena's army broke in the 2nd round, losing 14 factors while Wellington's army lost 9. Massena retreated to Lubeck, meeting another small French corps from Dresden which allowed him to partially make up for losses. In October Massena tried again. Showing little imagination for such a good marshall, he again chose escalated assault. This time Wellington surprised him with an escalated counter-attack. Massena had 19 French infantry, 8 French militia, one French cavalry, and 5 Hessian infantry against 35 British infantry, 8 Swedish infantry, and one Swedish cavalry. One Swedish corps had retreated into Hamburg before the battle. Again Massena's army broke in the second round, losing 13, including the cavalry, as compared with a loss of 7 for Wellington's army. Massena again retreated to Lubeck. As October came to a close another French corps was hustling northwards from France to make good Massena's losses. Another British corps had arrived at Hamburg, resulting in a stack of 4 British and 2 Swedish corps under Wellington. Apparently Napoleon has ordered Massena to bludgeon the Anglo-Swedish army repeatedly regardless of the cost, as it would not do to have Wellington's army break free from Hamburg to join with the Prussians or to cause other mischief. Besides, the British and Swedes are bleeding, and Napoleon's overgrown Empire can afford the losses. In fact, Napoleon is letting Massena burn through a lot of the militia reserves on this northern front. The political loss was negligible, more than made up for by dramatic gains for Napoleon in the South. The French sent a small corps of 5 infantry to take Dresden, which it promptly breached and took from 3 Austrian militia. This corps later reinforced Massena in the North. Another small French corps of 6 militia breached and took Erfurt from 1 Austrian infantry. The Bavarian corps abandoned the siege of Vienna and instead breached and took Prague from 1 Austrian infantry. The Bavarian corps later moved west to Dresden. 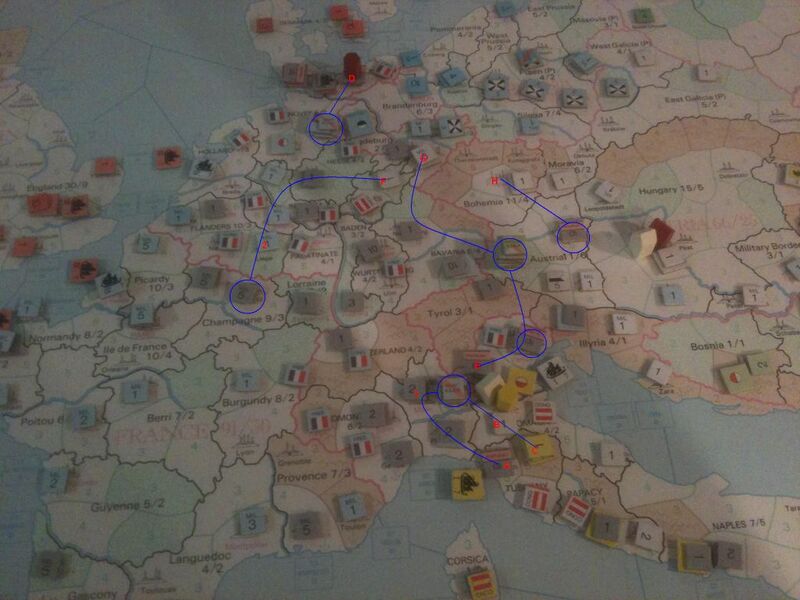 The big drama came in late October, with Charles' army acheiving a breach at Munich. Unfortunately for Charle's & company, he rolled a 2, 1, & 1 on the dice for the siege assault! This left 4 Bavarians out of the original 20 still alive and in control of the city when Charles' army broke (losing 5 factors). Charles will have to try again later. Meanwhile, a Prussian army of 5 corps under Blucher is marching into Bohemia via Theresienstadt, probably on the way to join Charles. Everybody knows that Prussia will declare war on France in December. Italy was the scene of a massive French blitzkrieg during these months. First, Napoleon himself with his main elite French army tried to catch Castanos' Austro-Spanish army at Mantua in August. Wiley old Castanos gave him the slip with a successful withdrawal to the area south of Bologna. The Wurttemburg corps was successfully breaching and taking Bologna. The Baden corps was, at the same time, successfully breaching and taking Florence. Both places were taken from single Austrian infantry factors, as best I recall. Davout, with a French corps and the Lombard corps was busy smacking the Portuguese corps at Leghorn on an eschelon vs. defend, killing a Portuguese infantry and cavalry for the loss of one French and one Lombard. But the big loss was that Davout himself was grazed by a cannonball, knocking him out of the saddle and out of the war until December when he will recover from his wound. In September the chase continued as the coalition army broke into two groups, one of 2 Spanish, 2 Naples, and 1 Portuguese corps heading for Sicily, and the other of 2 Austrian and 2 Spanish which paused at Naples under Castanos. The Spanish player later found out that he was not going to be able to keep the Naples corps simply by keeping control of Sicily, as he had thought. He hadn't read the rule on the Kingdom of Two Sicilies, and he's a bit rusty. In retrospect he might have been able to leave the Naples corps behind as screening corps in order to save the better part of Castanos' & Mack's army. Oh well, water under the bridge... live and learn and all that. The French and their minor allies formerly under Davout thundered south, taking Rome from what was either a Spanish or Neapolitan garrison, while Napoleon's main army made it from Mantua into a mountain area in the Papacy. The thing that really hurt was that Castanos & Mack only inflicted 6 casualties on Napoleon's forces, while losing 50+ of their own, 50 at Naples and others in various garrisons. Although the Naples corps will disappear in November when Napoleon finishes the conquest of Naples, the Spanish are taking heart from the fact that they have 2 Spanish and 1 Portuguese corps left in Sicily which can be used to strike back in Italy. (There are 5 other Spanish corps spread out in Tripolitania, Cyrenaica, Tunisia, Algeria, and Morocco in order to prevent loss of those territories due to instability zone effects.) Really too bad for the coalition that the army in Sicily is about 50 factors weaker than it might have been if the Neapolitan corps had been used to screen. There is some talk about the fact that 11 corps of Napoleon's army are at Naples, further south than we expected, and how that might be a good thing. However, if there is one thing that Napoleon's army has proved, it is their speed of marching. The Lombardy, Venetia, Wurttemburg, and Baden corps don't move so fast, as the political combinations that would give them greater speed have never been formed. But I expect to see Napoleon dashing across the Alps in the winter (game system doesn't prevent that) to restore the situation in Germany. It may be too late for the Bavarians, but so what? I don't think that the original French player ever wanted to have Bavaria as a low morale minor free state anyway. In October France, Britain, & Turkey went up due to won battles and French minor conquests, while Austria, Russia, & Spain went down. As always, Warren, thank you for the fantastic session reports for our game. That's now two sessions of horrendous, truly horrendous, Austrian die rolls that followed some very lucky die rolls three sessions ago. And, these are with my precision backgammon dice that I am very fond of. Such is the nature of luck. I think this next session is the only one I don't need to plan for. It's obvious to me what the next few months are going to look like based on corps positioning and the session will play out likely how we all expect it to in the south and central regions. In Russia, that's less certain. We'll see how that war plays out. Who knows! Do you use the artillery corps option? I like the way this report is set up - a good read. Yes. The French artillery is always with Napoleon and his Imperial Guard. It's always at the core of Napoleon's elite main army. The Russian artillery has often maneuvered with smaller Russian armies, including a small army of three corps that landed in Brittany in a war against France earlier in the game. It was with the small two corps force under Barclay that was run to ground and was wiped out at the SE end of Lithuania in October 1812, the last month that we played. Now all those guns are in the hands of the Turks. Frankly, I think the Turks should be allowed to build their own artillery corps after capturing so many Russian guns. I enjoyed reading the After Action Report from the perspective of the British ambassador; very thematic, well written, and formatted. A few minor notes from myself, as the French player, and then I will post some photographs. Napoleon ended up marching further south than I intended and I was surprised at the withdrawl attempt at Mantua. It was a gamble that turned out to be successful and bought the Coalition more time before Prussia enters the war. I had already calculated the probability of the outcomes for each chit selection that the Spanish could have made, along with all modifiers (tactical and cavalry superiority) and only if Castanos picked Defend against my Assault would he have a 5.5% probability of breaking the French in the 2nd round. All other chit selections guaranteed 3 rounds of combat, unless the Spanish/Austrian army broke sooner, which was 50% or greater by the end of the 2nd round, especially with a French +2 guard commitment. That being said, if the Coalition's goal is to attrit the French it probably would have been better to stand and fight. It is hard to say which would have been more beneficial in the long term, drawing me further south, or killing a few extra factors. One of the reasons that made attacking their combined army so attractive was the ability to cause to two Coalition members to lose political points. My goal is to drive them both into, or as close to, the Instability Zone as possible, which will affect their ability to hold and maintain minor countries. I was actually hoping that after the 1st battle of Mantua there would be remnants of their army left that I could attack again in the following month for further political point loss. In other words, the Coalition had great luck and strategic success in their withdrawal all the way to Naples; much better than I had originally planned for. Warren is correct that Massena had orders to hammer the British in the north before they can meet up with other Coalition forces. I will gladly exchange 2:1 losses to kill British infantry, especially if some of my losses are French militia. British infantry is high morale and their national manpower is low, which means it should take longer for them to replace. As he mentioned, I absorbed the political point loss by the captured minors and victorious battles in the south (and east, sharing with Turkey). Despite that, 1 or 2 points was lost by being pegged out at the top of the Dominant Zone. I will need to find a place to burn another political point next month or it also gets lost after the capture of Naples. I think I know where to spend it. I am looking forward to fighting in the upcoming winter. One of the goals that Turkey and I have been pursuing as part of our long term strategy is squeezing the Coalition economically, which I think we have been successful in doing. I am hoping it will restrict their ability to make big maneuvers. It will also be interesting to see what Prussia does. With their full strength army I might need to play more defensively until we see the outcome of the first battle. It is interesting that the Austrian player says there is not much planning needed. When I look at the board from his position I see several different opportunities ranging from conservative to aggressive. Not much planning needed because I knew what I was going to do at the end of last session. Now, if you do something unexpected, I will have to modify my plans accordingly. Now all those guns are in the hands of the Turks. Frankly, I think the Turks should be allowed to build their own artillery corps after capturing so many Russian guns. I completely agree. Also a fleet counter for Egypt would be nice too. Why are there two Free State markers in Piedmont and one in Burgundy? I don't think we are paying close attention to the conquered and free state markers on the map. Those of us fighting in Italy and western Germany pretty much know the status of all the minors. But misplaced markers are not helpful to the spectators. Maybe we should have a chart for the status of all the minors... Andrew? ... Perry? 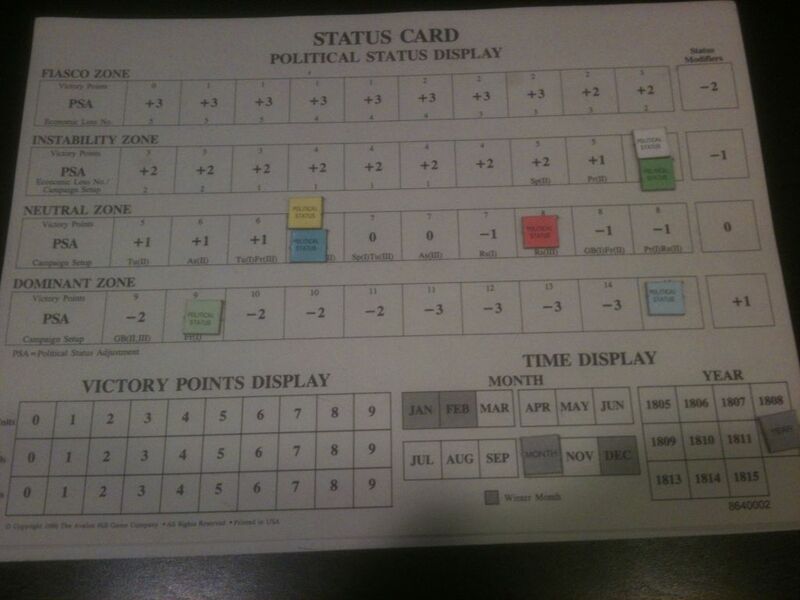 I am sure I can whip up a chart for Minors.